When 8 months preggers, I ordered hubby to paint the baby’s room. I had picked a mint green, perfect for the unborn boy or girl. I picked blues and oranges to complete the overall color scheme. Pretty unique I thought, and gender neutral. Now that my little newborn has exploded into a 3.5 year old toddler, he has plenty to say for himself about his room but he gives me a lot of creative freedom. I did not really want to go into a total redo/repaint as it would take a lot of time, and buying new items according to a new colour scheme is, I believe, just over the top. So, this is how I transformed his baby cocoon into a toddler paradise. Instead of repainting the whole room (which was completely mint green), I played up other colours of the existing overall colour scheme. One wall became a solid blue and one wall became striped by adding a complementary and brighter green as stripes over the mint green wall. The other 2 walls remained in the original mint green. 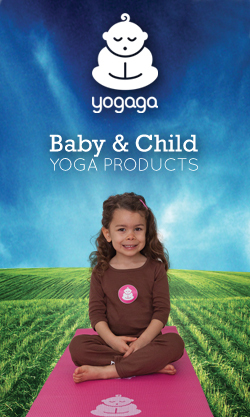 The result is a completely revamped look and feel with minimum effort. Measure your wall and decide how wide you want your stripes to be. Then mark off each line on the far left, the far right, and the middle with a small pencil mark. No need to actually draw lines on your wall (and not a good idea as these might shine through your paint) because you will use your painter’s tape from one side to the other to create a nice straight line for you. Next, simply paint your stripes using the roller (being careful to not go over the tape). Professional opinions are divided concerning when to remove the tape, but I read somewhere that if you wait too long till the paint is dry, your paint might crack when you remove the tape. On the other hand, when you strip it off too early, the paint might run. So wait maybe 15-20 minutes and remove the tape when the paint is still “flexible”. This is what I did and whether it’s right or not, it’s right for me because it worked and my lines are nice and clean. A simple untreated wooden bed from IKEA (dirt cheap) with a good quality mattress from Sleep Country finally got my big toddler out of his crib. One of the things I did want to change about the room was to replace some of the white with brown/wood. So I stained the untreated wooden bed. I also had an old, brown, small suitcase in the basement which I incorporated into the decor and my son loves to play with it too. Ikea had a wonderful duvet cover which completely reflected my colour scheme (orange, blue, green) and some existing pillows tossed in the corner completed the cozy bed-reading area. 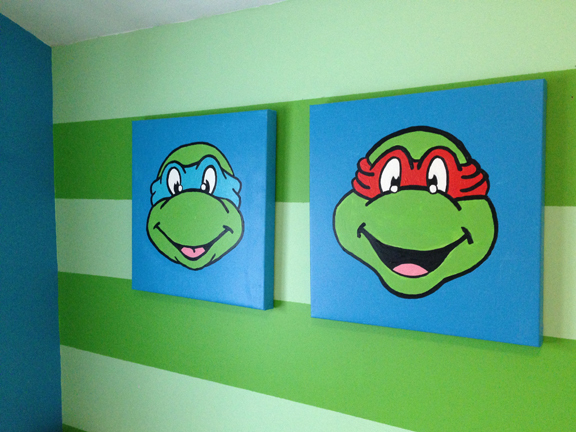 The Ninja Turtle artwork was also a DIY and was featured on The Motherboards previously. 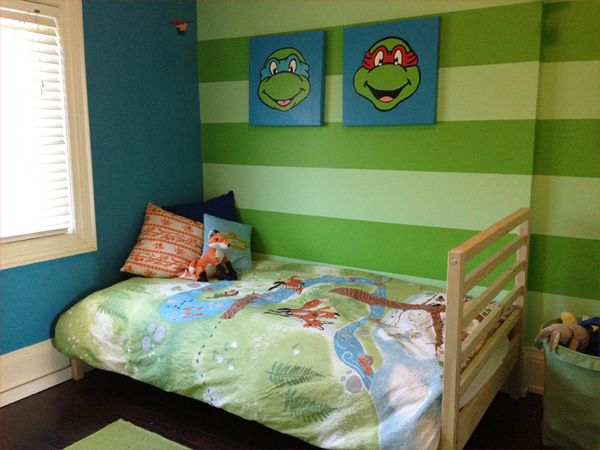 Have a look at Big Boy Room | Ninja Turtle Artwork. Do you know the brand and the three colors you used so I can get the exact ones? Tina, all paints are CIL brand. The grass green is called Topiary Green, the blue is called Tropical Holiday and the mint green is called Arboretum. Good luck and make sure to show us the results!